Corner House Accommodation is ideally situated in the seaside suburb of Summerstrand in Port Elizabeth, 1,5 kms from the beachfront, close to the Boardwalk Casino & Entertainment Centre, movies, restaurants, shopping centres, NMMU, golf course and only 5 min from the airport. We offer warm hospitality, friendly service and a good night’s rest for travellers, business executives, sports enthusiasts and holidaymakers. 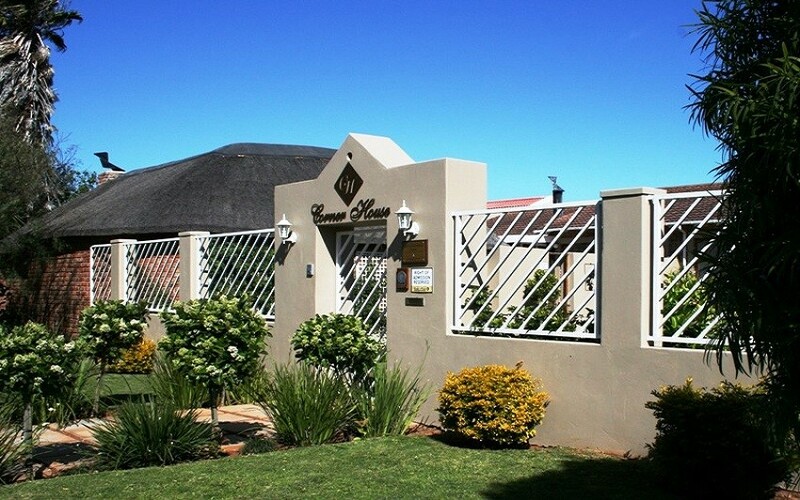 We offer comfortable B&B or self-catering accommodation in private suites each with twin beds or a king size bed, a sleeper couch, private bathroom (shower-en-suite) and fully equipped kitchenette. Each suite has a ceiling fan, coffee making facilities and DSTV (selected channels). All suites are serviced, have private entrances and safe off-street parking. Bedding and towels are supplied. For the comfort of guests, our suites are non-smoking. Wheelchair friendly. To enhance your stay we have a swimming pool as well as an excellent outdoor entertainment area with barbecue facilities. Our fully equipped conference room offers the ideal setting for your “out of office” meetings, break-aways, interviews or training sessions and can seat up to 12 people (U-shape). Catering is available by arrangement. Executive suite. King size bed or twin beds, sleeper couch, equipped kitchenette (B & B or self catering option). Private bathroom (shower-en-suite). Ceiling fan. Safe off-street parking at your doorstep. Remote entrance. King size bed or twin beds, double bunk (affordable option if you have small kids), equipped kitchenette (B & B or self catering option). DSTV (selected channels). Private bathroom (shower-en-suite). Ceiling fan. Safe off-street parking on remote. 2 Bedroom flat. King size bed or twin beds, equipped kitchen (B & B or self catering option)/TV/living room. DSTV (selected channels). Private bathroom (shower-en-suite). Ceiling fan. Safe off-street parking on remote on your doorstep. Wheelchair friendly.